Evening everyone! I hope your first day of June has been slightly less chaotic than mine has. 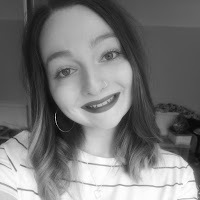 Had a horrendous train journey back to uni earlier with both trains being delayed, last minute platform changes (not ideal when you're carrying a heavy suitcase), busy carriages with no spare seats and broken air con! I mean seriously, what more could have gone wrong?! I finally made it back to Plymouth and got right into some nail art as I was so excited! I decided to use a plate that I received last year from Nail Art UK and absolutely loved the look of but never had a chance to use. It may have taken a while but I got there eventually! This plate is the Lina Nail Art Supplies 4 Seasons - Summer 02 and it's filled with a huge variety of fab summery images. 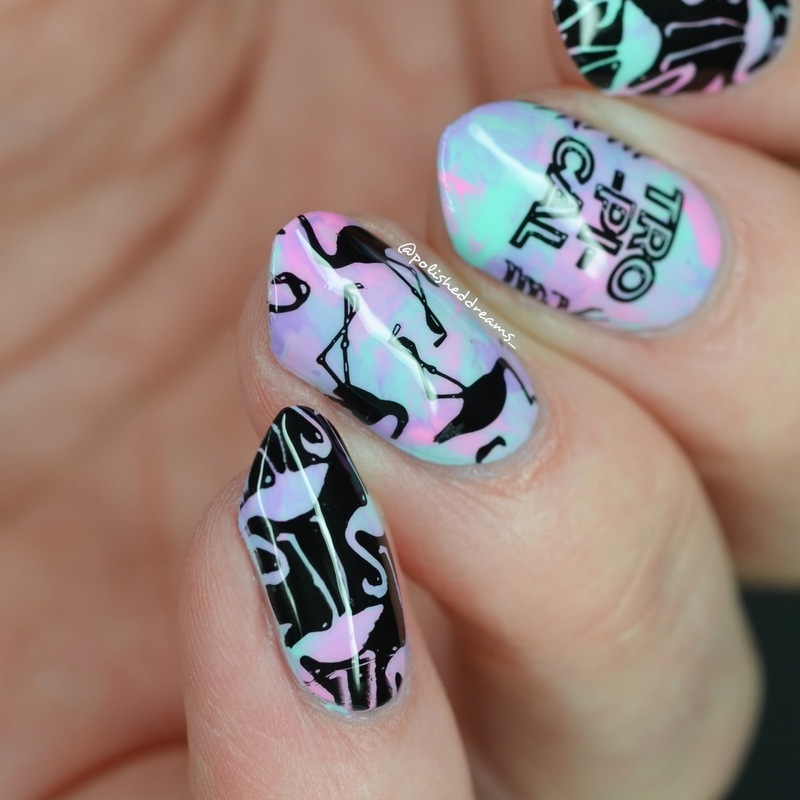 I've taken the image below from Nail Art UK's website as I'm completely useless at taking photos of stamping plates. How do people do it and not block out the images with the reflection of their camera?! For my first mani I decided to go with some pastel flamingos and I am loving how they came out! I began with a smoosh base of Pretty Serious Cutie Patootie, Bunny Foo Foo and Fluffykins that I purchased from Rainbow Connection UK. I then stamped over it with three different images from the plate using Painted Polish Midnight Mischief (also from RC) and made it all smooth and shiny with topcoat. I tried to use a variety of images so you can see what is available and how the different ones stamp. Overall they came out very well, especially when you remember I haven't picked up a stamper for however many months haha! 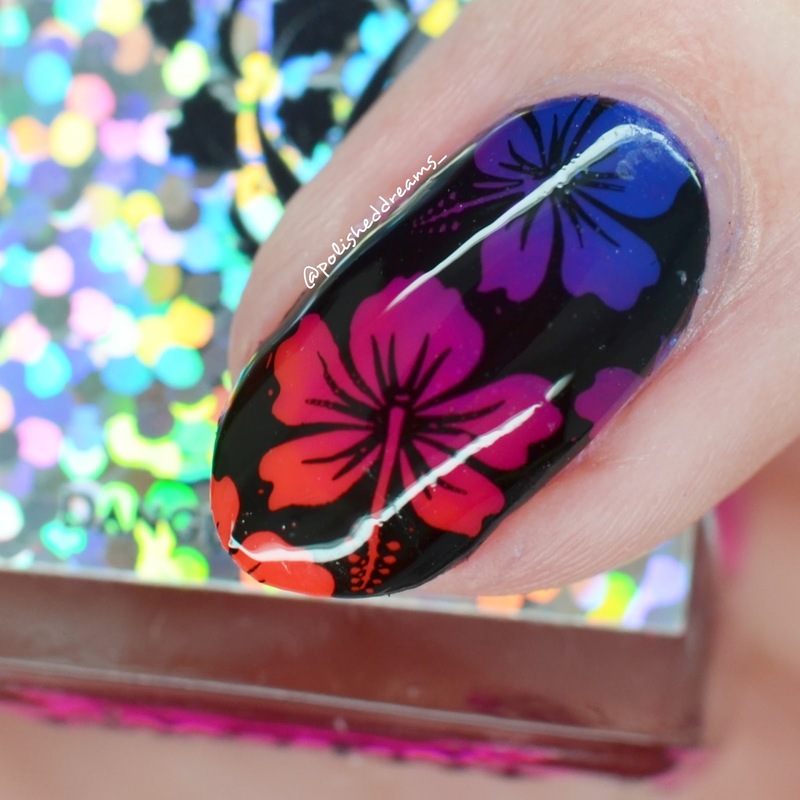 As it's a summer plate, I knew that for the second mani I had to use neons! 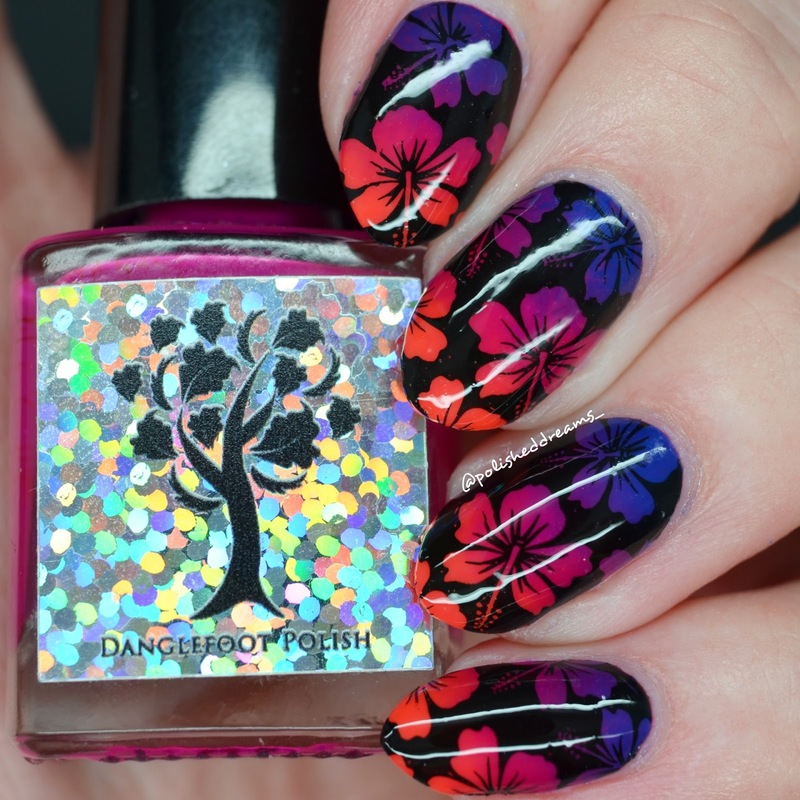 I dug out my trusty Danglefoot Polish neons in Dress to Impress, Ditch the Diet, and Steal a Kiss and did a gradient. I then chose the hibiscus silhouette (?) 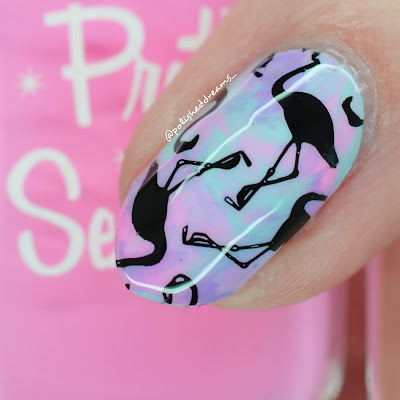 image and stamped that on all of the nails as I decided I wanted something a little more consistent this time. Again, the images stamped really well and I am so happy with the finished look. A coat of topcoat and we're away! 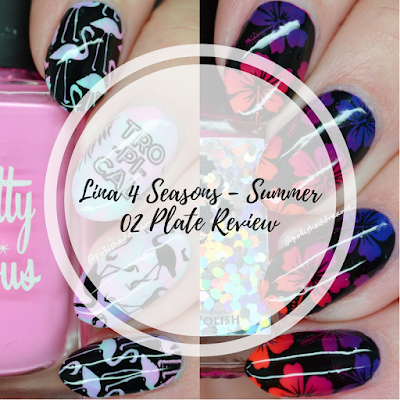 I think it's safe to say that like all my other Lina plates, the Summer 02 also performs really well! I'm just annoyed the topcoat got weirdly bubbly and I somehow ended up with smudges on my nails in the space of two minutes?? Hey ho, they're still lovely and bright and summery! Fingers crossed we get lots of nice weather so I have an excuse to use the plate more. I've got my eyes on the ant and crab images...just need to figure out what to do with them! The Lina Summer 02 plate is available here for a great price of £12.25. 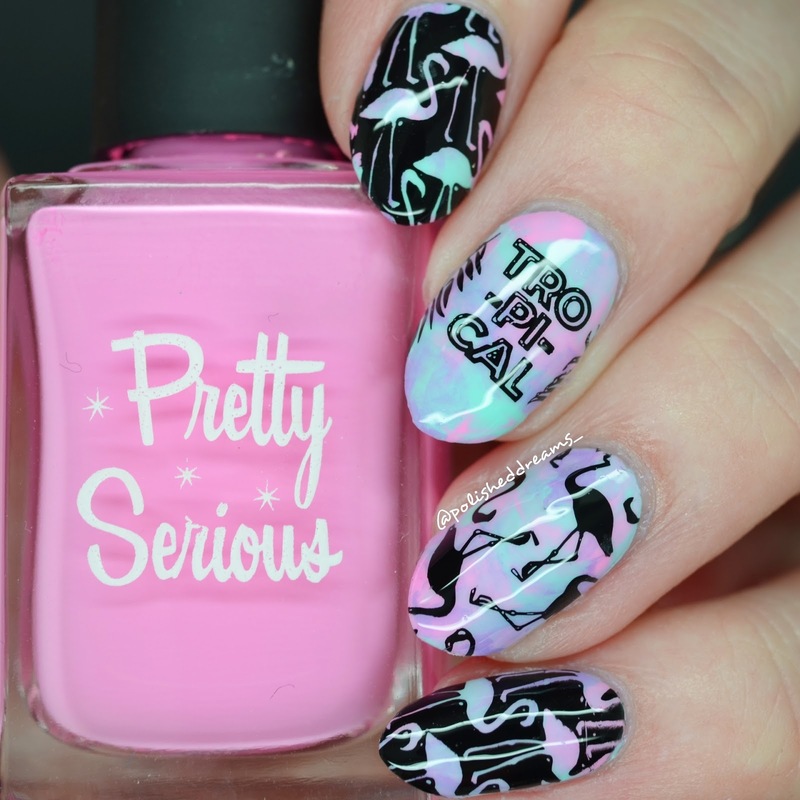 Nail Art UK have soo many other fab things in the shop so do have a nosy round the rest of the site! 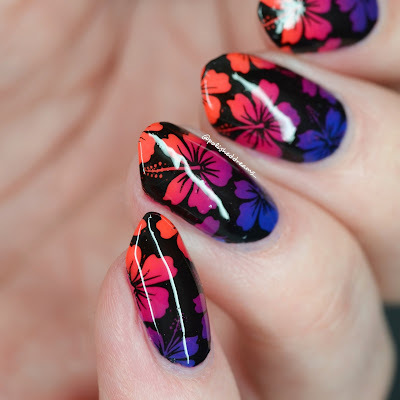 What did you think of these mani's? Any suggestions for what I should try next? Welcome to my little nail blog. 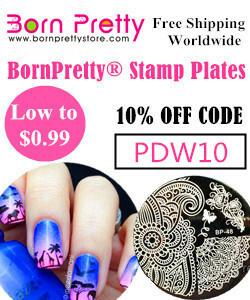 Here you'll find swatches, nail art and reviews of polish and other related products.